Hey there! Thanks for dropping by The Soundscape of India! Take a look around and grab the RSS feed to stay updated. See you around! Varanasi traffic is no different than any other busy city in India. 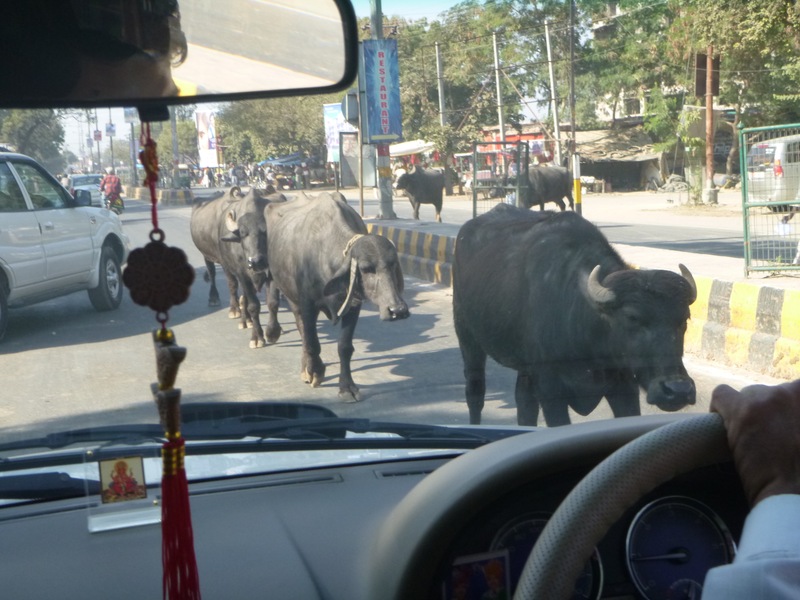 The dodging of both pedal and auto rickshaws, cars, trucks, bicycles, cows, goats, water buffalo, children and adults makes for a potentially stressful situation. The trust in rickshaw driver’s ability to navigate successfully through this maze is crucial. This cacophony of horn blowing definitely can put one on edge after constant exposure – one of the many ways that India forces you to grow in different areas (patience and acceptance) – or get out! We were trying to make it to the Ganges for the evening aarti ceremony when we hit a traffic jam. Our driver did an amazing job of making it through the traffic and help us to land at Dashashwamdh Ghat with plenty of time. 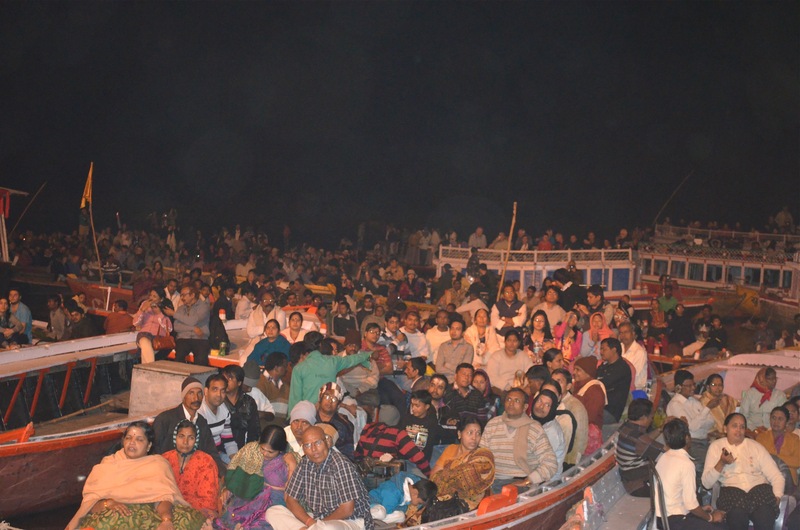 We had arrived late in the afternoon but in time to visit the Dashashwamedh Ghat for aarti. We jumped in an autorickshaw and zipped along until we arrived at the old city of Varanasi where traffic condensed and we lurched and edged our way through to the closest place for parking that was allowed. Our guide walked ahead of us leading us through the maze of pedal rickshaws, cows, goats, pedestrians and shops to the edge of the ghats. We climbed down the steep steps and arranged for him to meet us in a certain spot after the ceremony. 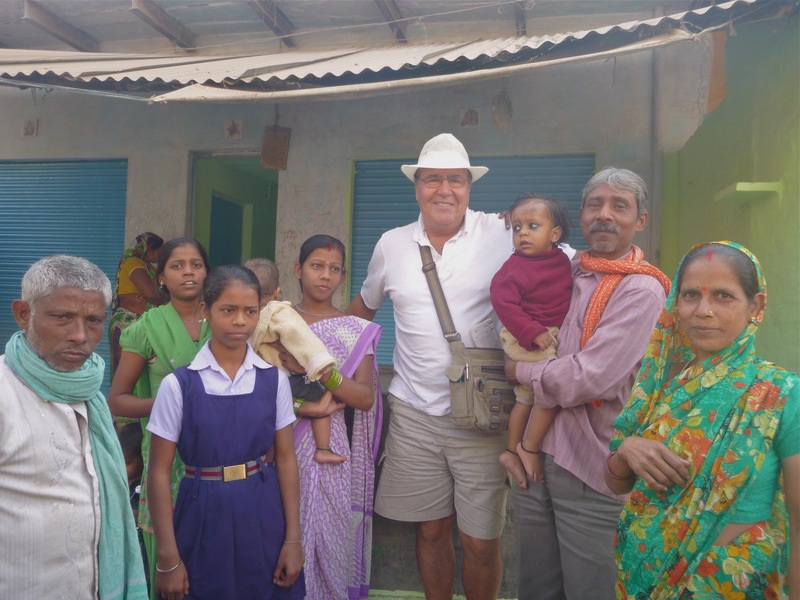 I led us to the front of the five platforms to landings that were already populated by Indians and tourists alike. We sat there waiting for the ceremony to begin and just took it all in. The feeling of heightened anticipation and the smell of incense permeated the entire area. Some people were eating with families while others were selling kum-kum (coloured powder to place on your forehead), offerings made of marigolds with rose petals filled leaf bowls with a dollop of ghee in the center to light before releasing it into the Ganges with a prayer. Boats filled with tourists lined the waters edge and layered out into the middle of the river – a sea of boats everywhere. Kids darted in and out running up and down the stairs while devotees sat on the stair landing above already in reflective prayer. And then the ceremony began with chanting and the ringing of bells. They resounded crystal clear, shattering any mental thoughts you may have had before and bringing your attention to the present moment, centered and attuned to their ritual. We sat mesmerized as Hindu priests performed their religious rituals using incense, fire (from ghee), chanting, bells and movements that flowed in all four directions. We had befriended an auto rickshaw driver named Veejay while in Varanasi who took us everywhere we wanted to go. He had a kind heart and was so helpful in fulfilling our early demands and late shopping sprees – very touching. 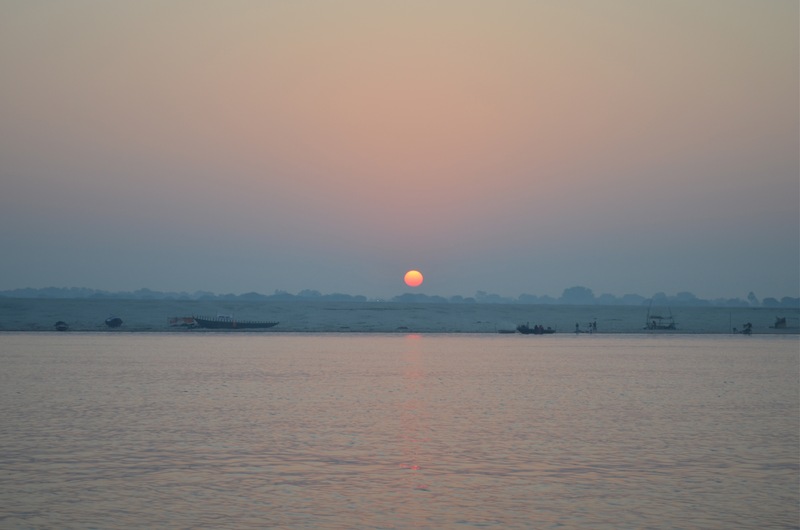 This morning we had arranged with him to pick us up at 5:30am to take us to the Ganges to watch the sun rise over the Ghats. After the ceremony the night before, we were exhausted and found our pace towards Veejay’s auto rickshaw slowed and sleepy. It was still dark and in preparation for the cold temperature, I brought a blanket from the hotel for us to wrap ourselves in. We zipped along the virtually empty streets – a vast difference from the traffic of yesterday’s drive to the Ghats. We arrived and were led down a dark tented area where people were still stirring. Veejay took us to the boat area and told us what to pay – 300 rupees total. 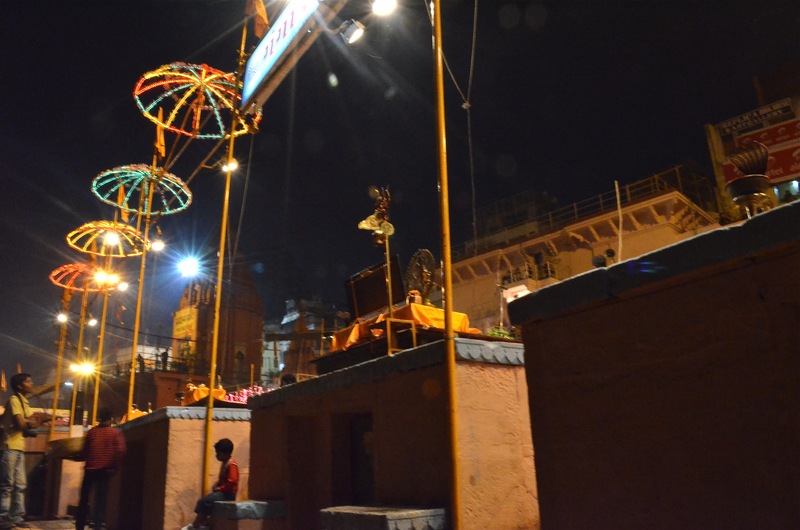 As we waited for the boat to arrive, the quietness of the Ghats was in such contrast to the ceremony the night before. The sun began to light the sky with pink hues and we stepped onto our boat with the help of our boatman and began to row toward the sun away from shore. The early morning at the Ghats brings a whole other side and experience of this holy river. Men and women alike are bathing (in separate locations) while laundry is being beaten to cleanliness and then laid out to dry. 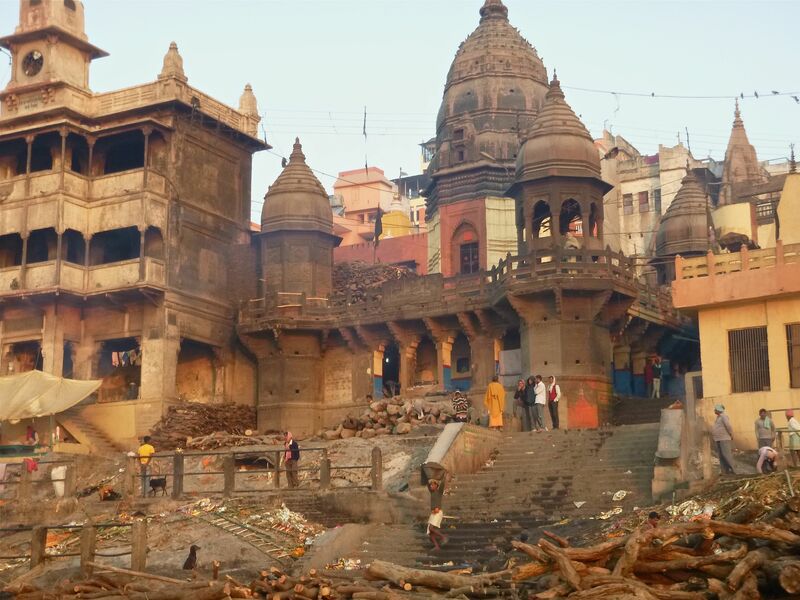 Sadhus arrive and begin their meditation while blessing those that come before him and further up the river at Manikarnika Ghat, bodies arrive shrouded in saffron and marigolds and are laid on a funeral pyre and burnt at the rivers edge. If the body it not fully burnt, they’re still released into the river for salvation. As we rowed along the river, the sound of water lapping, birds chirping, boat vendors calling out and the odd boat with chanting devotees passing by were the only expressions here. As the sun rose up off the horizon burning its way through the pink hues and turning the sky blue, we headed back to our boat docking location. Veejay was there to meet us and take us back to our hotel to dine, nap and enjoy our afternoon. Here is a map of the soundscapes conducted in Varanasi. The blue markers give brief information of where each location is. I hope you have enjoyed listening and sharing in my experience.